Coverage: Live commentary on Radio 5 live, online, tablets, mobiles and BBC Sport app. Text commentary on the BBC Sport website and app. Highlights on BBC Two at 19:00. 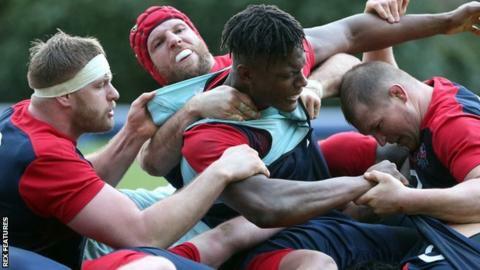 Saracens forward Maro Itoje is in line to make his England debut after he was named on the bench for Sunday's Six Nations game against Italy in Rome. The 21-year-old can play in both the second and back rows. The starting XV shows three changes from the team that beat Scotland 15-9 last weekend. Lock Courtney Lawes, loose-head prop Mako Vunipola and scrum-half Ben Youngs come in for Joe Launchbury, Joe Marler and Danny Care respectively. "We've made a few changes to the line-up for Italy," said head coach Eddie Jones. "I believe this is the strongest 23 to go to Rome and get the performance and result we want. "Mako, Ben and Courtney have been pushing hard for selection during training, but they also fit the game plan we want to implement against Italy." Itoje joins a bench that also contains fellow former England Under-20 captain Jack Clifford, who won his first cap as a replacement against Scotland and turned 23 on Friday, and uncapped Northampton prop Paul Hill. Head coach Jones has opted for a 6-2 split among the replacements, with the uncapped Bath back Ollie Devoto dropping out to make way for Itoje. Care and Saracens full-back Alex Goode are the two backs on the bench. Mike Brown (vice captain, Harlequins); Anthony Watson (Bath), Jonathan Joseph (Bath), Owen Farrell (vice captain, Saracens), Jack Nowell (Exeter Chiefs); George Ford (Bath), Ben Youngs (Leicester Tigers); Mako Vunipola (Saracens); Dylan Hartley (captain, Northampton Saints), Dan Cole (Leicester Tigers); Courtney Lawes (Northampton Saints), George Kruis (Saracens); Chris Robshaw (Harlequins), James Haskell (Wasps), Billy Vunipola (vice captain, Saracens). Replacements: Jamie George (Saracens), Joe Marler (Harlequins), Paul Hill (Northampton Saints), Joe Launchbury (Wasps), Maro Itoje (Saracens), Jack Clifford (Harlequins), Danny Care (Harlequins), Alex Goode (Saracens).